Charles Wilfred Jeffreys was born in Chelmsford, and educated at the town’s Grammar School, Hurstpierpoint College in Sussex, and in Somerset. 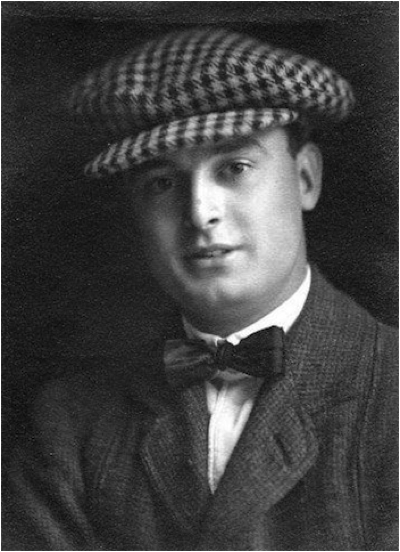 He joined his father’s outfitters and clothiers business before enlisting into the army in September 1915. He went to France in June 1916 and obtained his Officer’s Commission in May 1917. He was killed in action near Ypres in October 1917. His home was in Mildmay Road. Charles was born at Albert Place, New London Road, Chelmsford on 6th March 1892, the eldest child of the outfitter and clothier Frederick Herbert Jeffreys and Helena Edith Jeffreys (nee Smith). His father had been born in 1865 in St. John’s Wood, London; his mother c1868 in Chelmsford. The couple had married on 10th December 1890 at the London Road Congregational Church in Chelmsford. Their honeymoon was spent in Hastings. 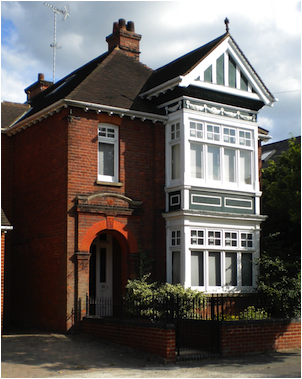 The following year they had been resident at 7 Albert Place in New London Road, Chelmsford (today’s number 124). manage Mr. Nickols' branch shop, in the High Street near the Stone Bridge. A few years later Mr. Nickois took Charles’ grandfather into partnership, and the firm became known as Nickols and Jeffreys. 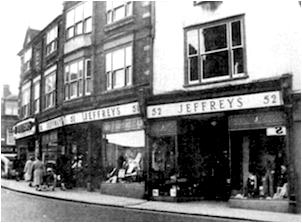 The business extended, and when Mr. Nickols died in 1897 Charles’ grandfather took over the two shops, the one at Chelmsford and the other at Maldon, and the name was changed to Jeffreys and Sons. The partnership consisted Charles’ grandfather and Charles’ father and uncle, Arthur John Jeffreys. When the latter died young in 1899, his position in the business was taken by a third brother, Charles William Jeffreys, who was then in the teaching profession, as an assistant master at Dulwich College in London. Mr. Nickols had the distinction of being the first person from Maldon to be cremated. Charles’ four siblings, all Chelmsford-born, were May Doris Jeffreys (1893-1925), Mabel Winifred Jeffreys (1898-1988), Frederick William Jeffreys (1903-1980) and John Murton Jeffreys (1907-1945). Charles was educated at King Edward VI’s Grammar School, Chelmsford from September 1899 to April 1902. At the time of his admission his father was described as a clothier of Bridge House, High Street, Chelmsford. The 1901 census listed nine year-old Charles living with his parents, two sisters and two servants at 52 High Street, Chelmsford, where his father still ran the clothier’s and outfitter’s business. September 1911 and December 1918. When aged 15 Charles left for Hurstpierpoint College in Sussex and later studied at Dr. Morgan’s School in Bridgewater, Somerset. The 1911 census captured 18 year-old Charles staying with his widowed maternal grandmother Harriet Elizabeth Jeffreys (aged 75), aunt Emily Jeffreys (aged 51) and two servants at Wimborne in New London Road, Chelmsford (today’s number 182). The house had been built for Charles’ grandfather William Jeffreys who had died there in 1910. Charles was an outfitter’s assistant, working for his father; his grandmother survived on ‘private means’. At the time Charles’ parents and siblings were living at Mayfield, (Upper) Mildmay Road, Chelmsford. On 6th September 1914, when aged 22 years and 180 days and working as an outfitter, Charles attested at Chelmsford to join the army, passed his military medical; he was approved to join the 17th Lancers and was given a service number of 8068. His preference was to join ‘any cavalry regiment’ and he agreed to serve for the duration of the war. Charles was a relatively well-built man for the time. He was five feet eight and a half inches tall, weighed 153 pounds, had a chest of 37.5 inches which could expand by three inches. His physical development was ‘good’. He had a fresh complexion, hazel eyes and brown hair. His religion was Congregationalist. 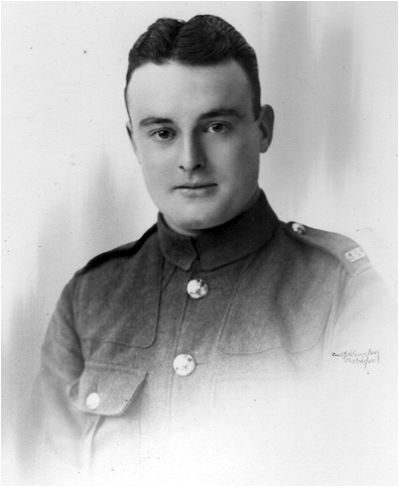 Charles joined the 3rd Reserve Cavalry as a Private on 9th October 1914, and on 15th June 1915, after 282 days in the army, he embarked to France to join the 6th Dragoon Guards as a Lance Corporal where he served in B Squadron. Commission with an infantry battalion. On 22nd December 1916, after a year and 190 days in France he was posted to the 3rd Reserve Cavalry Regiment and sent back to England as a candidate for a Commission. On 6th February 1917 Charles joined Number 3 Officer Cadet Battalion at Artillery Ground, Whiteladies Road in Bristol. 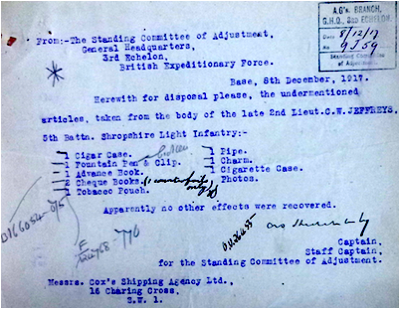 On 29th May 1917, Charles was discharged to the 3rd Battalion of the Shropshire Regiment having been awarded his Commission as a Second Lieutenant. He subsequently joined the Regiment’s 5th Battalion in France and Belgium. “Second-Lieut. 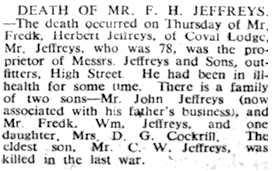 Charles W. Jeffreys, Shropshire L. I., killed in action on Oct. 17 at the aged of 25, was the eldest son of Mr. and Mrs. F. H. Jeffreys, of Mayfield, Chelmsford. In the early days of the war he joined the Dragoons, and during the training was classed a first-class shot and rider. After serving for 20 months in France he was offered a commission. Having passed through the Cadet school very successfully he was posted to the Shropshire L. I., and again went to the Front. Altogether he had served just on two years abroad. Lieut. Jeffreys was an Old Chelmsfordian and completed his education at Dr. Morgan’s School at Bridgewater. He had many friends in civil life, and will be greatly missed, especially among sportsmen. Prior to the war he assisted his father in the business of Messrs. Jeffreys and Son, outfitters, High-st., Chelmsford." Charles has no known grave and is commemorated on the Tyne Cot Memorial, Zonnebeke, West-Vlaanderan, Belgium, on the Civic Centre Memorial, Chelmsford. He was also commemorated at the London Road Congregational Church, Chelmsford. He was not commemorated on the war memorial at St. John’s Church, Moulsham. Charles’ estate was valued at £150 12s. 8d. The 1918 register of electors listed Charles’ parents at 62 Mildmay Road, Chelmsford (later renumbered as 151, pictured). Later they lived at Coval Lodge, Rainsford Road, Chelmsford. Charles’ grandmother Harriet Elizabeth Jeffreys died early in 1918. Charles’ mother died in 1936, aged 68. His father died in 1943, aged 78 and left an estate valued at £17,249.